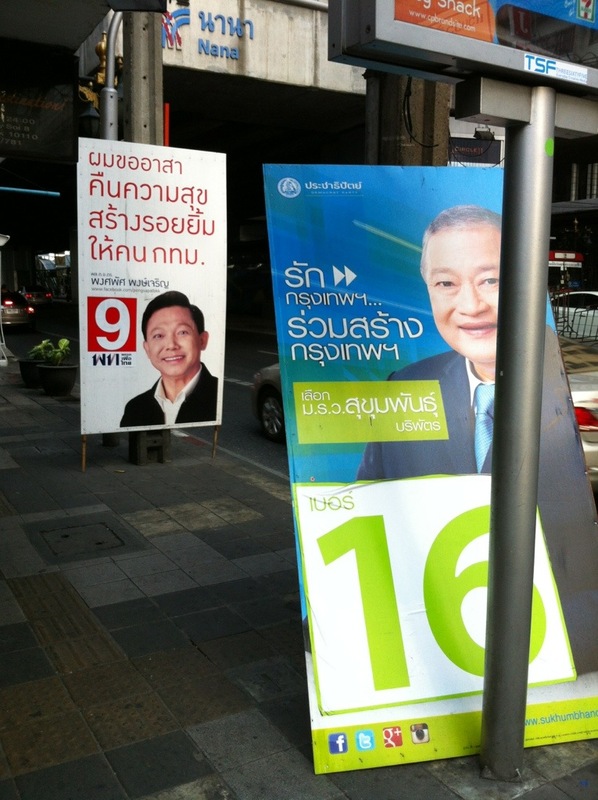 Bangkok sidewalks are hard to navigate at the best of times- food carts, street venders, cracks, poles- but elections add a new obstacle with the dreaded campaign poster. Yes, massive in height and of a good width and always featuring a candidate with one of two looks: a smile or tough guy look. The smiling candidate posters will list all the campaign promises and how the daily frustrations of Bangkokians will be rectified promptly if the candidate is elected; the tough guy look posters feature the ‘stamp out corruption’ message as, just like in every country, corruption simply cannot be tolerated, at least publicly. Candidates also have trucks of ‘volunteers’ driving through the city with the candidates promises blaring from loud speakers. There is little joy of dodging the smoke spewing from a side walk food cart, bumping into a massive campaign poster and then being accosted by the message pouring from a loud speaker clad truck filled with bored looking volunteers. And the city is supposed to be dry. Yep, the election is on March 3- so alcohol is not to be served that day. To enable voters to be of sound mind and body, alcohol is also prohibited from being sold on March 2 after 6pm. Oh yeah, bar and restaurant owners are very happy. Regarding alcohol sales- this is Bangkok, there are work arounds. Bars and convenience stores that do not use a cash register will sell alcohol you booze (if you’re nice about buying it), many bars will be filled with patrons drinking from coffee mugs or cups that are not transparent or the bar will ask patrons not to drink alcohol in places visible from the street. If you’re desperate, head to a bar housed within a western owned hotel- these are usually serving. If you’re really desperate, take a trip out of Bangkok for the night, this is a local election, not a national one. And don’t ask me why foreigners, who cannot vote, are subject to the alcohol ban. This entry was posted in Bangkok, Culture, Food & Restaurants, Politics and tagged alcohol, bangkok march 2013. Bookmark the permalink.